As value investors, we look for investment moats. Wider the better. Wide moat stocks are rare as it indicates a competitive advantage and posits that the company is able to defend this competitive advantage, now and in the future. But how do we see the future? The SWOT framework helps in conceptualizing the competitive landscape a company has today, and the defenses it possesses towards any threats. Once we have a good idea of these, we can then make a judgement on whether an investment moat exists. Moat stocks can be found using the SWOT analysis framework, so let’s take a look at what SWOT is and how to conduct a SWOT analysis. 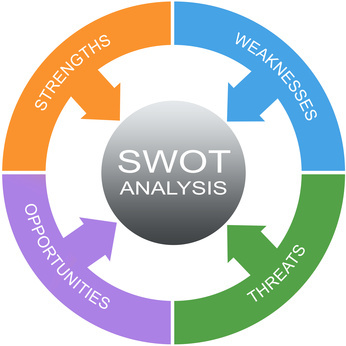 Back in my consulting days, SWOT analysis used to be a quick way to zero in on some of the key challenges and opportunities in the market for a business (just like you would use SWOT to build a business plan). What I really like about SWOT is that it forces the investor to take a big picture view of a business and use common sense or readily available data to figure out the industry or sector dynamics and the company’s market position. SWOT stands for Strengths, Weaknesses, Opportunities and Threats. Like all useful tools it can be as simple as you want or you can dig quite deep to get a better picture of your investment candidate. SWOT is especially useful for a value investor who believes that the company in question has a moat (sustainable competitive advantage) that will continue to protect the company’s industry leading profit margins and market share against current and future competition. Ideally, you would have already evaluated the financials to understand whether the business currently enjoys good profitability before you start digging into the market dynamics. I will take each element of the SWOT and lay out my thoughts and ideas on what can be done. Depending on the business and the industry, your analysis may lead you to investigate different topics but as long as you are using the framework you should reach useful conclusions. One should start with the financials to get a picture of where the company’s strength lies. For example, a company like Wal-Mart (WMT) has unmatched strength in distribution, logistics, and procurement and has tremendous inventory leverage. So Wal-Mart is able to translate its heft into lower costs by a) procuring inventory at lower costs than the competitors, b) turning over the inventory faster than the competition, and c) shipping the inventory to its retail stores less expensively compared to the competitors. Coca Cola (KO) on the other hand has tremendous name recognition and brand loyalty that ensures that it can retain pricing power in face of increased competition. Proctor and Gamble (PG) and several other similar companies are essentially marketing/brand management companies as they know that is where their strengths and profits lie. Other forms of strengths may be in terms of perceived quality (Japanese auto makers), customer service (Nordstrom), engineering and design (Apple – AAPL), R&D (Intel – INTC, Merck – MRK), regulated monopoly (most utilities in their service areas), business practices to lock in future demand (giving away printers to generate high margins on printer cartridges – HP (HPQ), razor blades – Gillette, etc), legal addiction (tobacco, fast food, etc). Most of the time, the weaknesses will be in the cost structure and the operations of the company where they may not be working at the optimum efficiency. For example, many regulated monopolies do not have the pricing power they need to quickly react to the changing input costs. Or in cases of commodity products, the company may have zero pricing power and is essentially a price taker (airline seats, metals, produce, etc). Unless the company is able to differentiate its product in some way to command a better price, it is difficult for a company in this situation to generate any meaningful shareholder wealth. Other times a weakness may be more subtle. For example, a company like AMD is essentially a follower of the product standards set by Intel. Without innovations of its own, AMD is unlikely to command a premium position in the chip market. Here we are looking for opportunities that may be available to the company to grow its market share at a ROI better than the industry. Some of the common opportunities may be in the line of entering new markets, weak competition (that can be eliminated, one way or other), patent pipeline, growing portfolio of products/services, anticipated regulatory changes, new technologies, etc. For example, as the traditional methods or oil discovery and production become more and more difficult and the oil prices rise, it is now feasible to start producing oil from tar sands, which is a new opportunity for some existing oil majors as well as new players. It is important to pay close attention to competitive threats. However, it might become necessary to expand our definition of what constitutes competition. For example, any analysis of newspaper companies about a decade or two ago would not have been complete without a reflection on the threat that internet poses to the traditional methods of news delivery. Today, cloud computing is definitely a threat to the traditional hardware and software vendors. Putting it All Together – How Do We Find Wide Moat Stocks? We will take Amazon.com (AMZN) as an example. Amazon started out selling books at a discount in the era when quite a number of traditional book sellers were struggling to stay profitable. While selling books on the internet was an innovation, the barriers to entry in this space are very low. Recognizing this, Amazon added innovations such as one-click checkout, free shipping, etc to build a brand and lock in customers to its service. Even these can be duplicated and lose effectiveness over time. As a result, Amazon continues to innovate and enter (or create) new markets such as eBooks, Kindle reader, self publishing and so on. Amazon has grown from a pure play book seller to now offering electronics and many other products, but at its core, its business survives due to the innovations it pioneered and continues to do so. Is Amazon going to be able to keep innovating and stay one step ahead of the competition? Perhaps not. Has it done well so far? – definitely. Would I buy the stock based on its future profit potential? Not likely, unless it can be purchased at a steep discount to its current economics. Another useful framework to consider in your investing is the BCG Matrix. This is again borrowed from consulting days, and it is quite remarkable how much value investing depends on the basics of business analysis.